Cardiff should have won this game with some considerable ease as Blackpool struggled to get any fluency in possession of the football and weren’t effective enough without it. Blackpool with a flatter than usual back four. Sorry, no extra 's' above in Gunnarsson. Blackpool fielded an unchanged side in their variant of a 4-3-3 with Gary Taylor-Fletcher once again at the tip of the central midfield triangle. The actuality of the shape will be discussed later on. Cardiff dropped Robert Earnshaw, presumably for tactical reasons as Malky Mackay replicated the approach of both Derby and Ipswich by packing the midfield. He has his side man for man in the middle of the pitch setting them up in a rough 4-5-1 formation with Peter Whittingham advancing to support Kenny Millar, who acted as the lone striker. Again the centre of the pitch was the focus of the battle and Mackay made the right moves. For the third home game running a manager has packed the midfield. Whilst Derby packed the midfield to great effect they were opportunist in seizing their win, Ipswich did well in stifling Blackpool but appeared to have no game plan in possession. However, Cardiff both stifled Blackpool excellently, but were technically much more competent on the ball than the other two teams and were able to structure their attacks with more cohesion. Why did Cardiff win the centre ground? Blackpool’s shape on and off the ball was inconsistent at times, on paper they matched up 3 v 3 in the centre, but when Gary Taylor-Fletcher failed to recover his off ball position this left Blackpool outnumbered in the centre. There are certainly questions about Taylor-Fletcher’s effectiveness in a midfield role. He is certainly excellent in the final third for such a role, but in tight games like this he needs to not only recover position but close out the opposition and make tackles. Is Taylor-Fletcher more effective starting deep and drifting up the pitch or starting up and drifting deep? Arguably the latter is the preferred option as it frees him from defensive duties and he is harder to track from the higher starting position, asking questions of the opposition defence and midfield as he sneaks in to space. This has the feeling of last season when Blackpool struggled in the Premier League when losing sight of their flatter midfield three and only recovering it when 3-1 down to Wigan at home. Will Holloway seek to restore the flatter shape for his midfield three or will he persist with one man advancing and Blackpool straying towards a 4-2-4. Cardiff completely outworked Blackpool in the centre. As soon as a Blackpool player received the ball a Cardiff man went to close him down immediately. They shared the work load well and Peter Whittingham put pressure on Barry Ferguson in the deep and always looked to get goal side of him. On the other hand, Blackpool’s pressing was sporadic at best and at times almost seemed to invite Cardiff to turn and attack them. Winning the centre ground in a football match doesn’t guarantee a team anything, however, given that Cardiff were so dominant they also performed much better in other aspects. None more so than the work of Whittingham, Craig Conway and Don Cowie. As Kenny Millar performed a lone striking role they worked superbly to get forward to support him, giving him passing options and especially Cowie and Conway getting in to dangerous positions in wide areas. Added to this they were composed on the ball in and around the final third and delivered some very tricky crosses and passes that through a combination of Blackpool defending and Cardiff poor finishing ensured that they inflicted little real damage. Conway in particularly looked very dangerous picking an excellent pass in the deep which split open Blackpool’s dis-organised high defensive line as well as laying on the cross for Cowie’s goal. 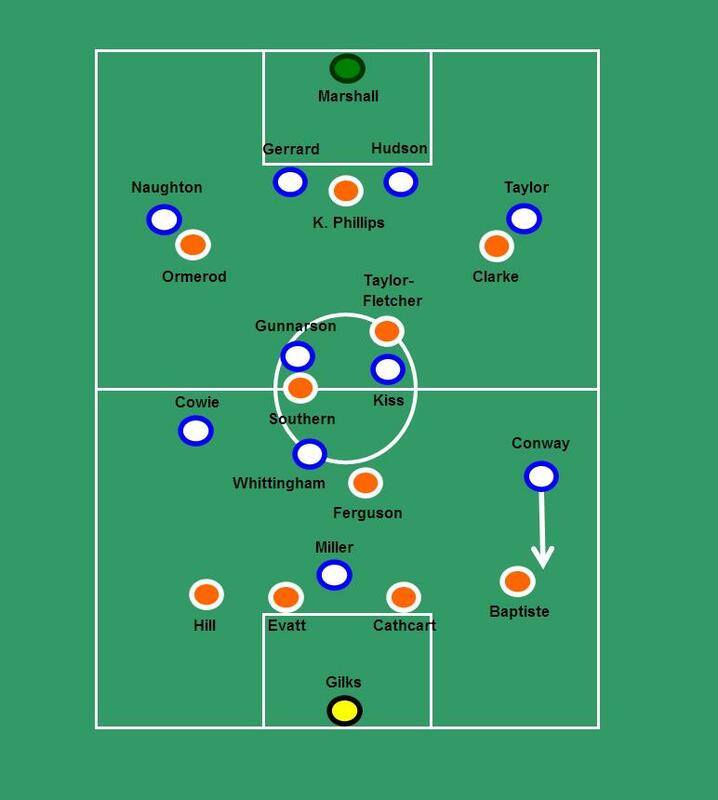 An interesting observation about this match was how little Blackpool’s full backs got forward. In a number of games this season, Blackpool’s stepped up their game when Alex Baptiste progressed forward. In this match he rarely got forward, it could be assumed that this was more to the excellent play of Cardiff’s wide men ensuring that they were continually occupied. It’s likely that to be the case rather than Ian Holloway asking them to sit as that was hardly a ploy he tried in the Premier League and certainly not something that would help Blackpool. Matt Hill in addition to staying back also strayed very centrally and seemed uncomfortable in keeping his width and stepping higher up to support the midfield. The moment that Stephen Crainey came on Blackpool looked like holding on to the ball better. He understands the role and how he can influence the game from full back. Helping to support the midfield offering passing options, but also in getting the ball up to the forwards as he did in the lead up to the Blackpool equaliser. Cardiff have a solid looking Championship team, functional, spirited, flexible, creative and reasonably well-balanced. However, they may need to find someone more clinical to play the lone striker role when they play away from home in order secure more victories. Blackpool on the other hand may not function as poorly as this all season and win a point when defeat seemed likely. Holloway will take encouragement from his substitutions, the real question centres on his ability to deal with teams who come to Bloomfield Road to match up his midfield three. A lot of the time Blackpool will move the ball around better than this and win more games, however it is when the ball stops moving do issues become apparent. He might need to ask his players to solve these situations ‘in game’ with more effectiveness, or he may seek tactical changes to flex their approach. « What is the golden rule?